FLIR Systems, Inc. (NASDAQ: FLIR) today announced the selection of the FLIR T500-Series as a “Red Dot: Best of the Best” winner for 2018. The “Red Dot: Best of the Best” is awarded for groundbreaking product design and is given as the top prize for the best products in their category. As the second FLIR product to win the award in consecutive years, the T500-Series joins the FLIR Exx-Series as an outstanding professional tool recognized for superior design. The FLIR T500-Series incorporates thoughtful ergonomics into a ruggedized, high-performance thermal imager. A lightweight magnesium interior and 180˚ optical block rotation allow for hours of comfortable operation, and a shatterproof Dragontrail® touchscreen offers peace-of-mind on even the roughest job sites. While recognized for its design excellence, the T500-Series also includes a wide range of advanced features with professionals in mind. Laser-assisted autofocus allows quick, accurate readings, while FLIR Vision Processing™ combines IR resolution, MSX® and UltraMax® image to create a detailed, brilliant thermal image with very little noise. 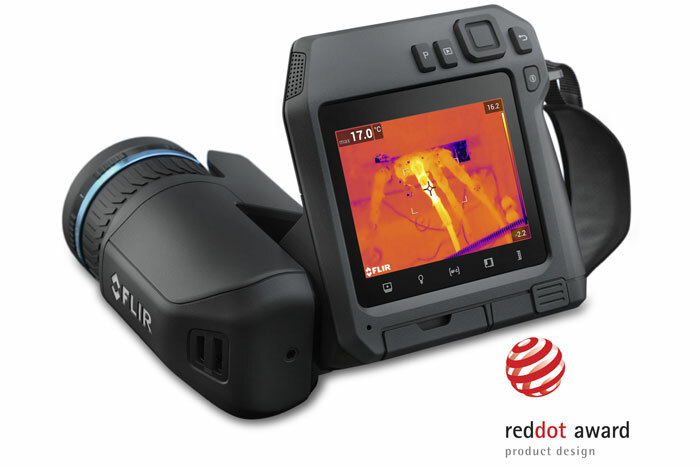 The award-winning FLIR T500-Series is now available for purchase through established FLIR distribution partners.